So I tried the pickles for the first time, and they still taste…green? They still taste more cucumbery than pickley. Does anyone know if this is because I did something wrong or they just need more time to pickle? This is my first time making pickles so I’m not sure what should be happening. Any advice/suggestions would be appreciated. Not too bad, for my first attempt! After looking at all the super-interesting wonky log cabin blocks people have been making for virtual quilting bees or for their own quilts, I finally decided to try my hand at it. Although it may be surprising to people who know me, it was difficult for me to imagine working on something without clear cut instructions on how to do it. Up until this point, I have really depending on cut and dry instructions on how to do things, even if I do end up modifying them somewhat, it is comforting to know you are doing something that has a definite end result. But at the same time, looking at all the all the scrappy wonky log cabin blocks on Flickr, I really fell in love with them. I like how each one is unique, and how even with the same fabrics, you can get a different result every time. I wasn’t sure how to start, but I found a great tutorial which was a jumping off point for me. Once I finally got over the insecurity of making something up on my own, making this block was not nearly as difficult as I initially thought. Once again, I mad let what I think is going to be an impossible feat (see free motion quilting) keep me from trying something I really want to do! I need to have more confidence in my abilities and take those risks, however small they may be, because in the end those things end up enriching my crafts, and make me better at them. 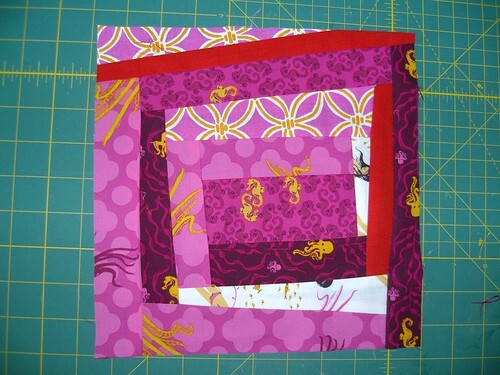 I used some leftover scraps from my medocino quilt, and while I don’t have enough to make more than a couple more 9.5 ” blocks like this one, I will have plenty of new scraps from the stacked coin quilt I am working on for my goddaughter’s 1st birthday! The condensation on the jars make them look cloudy but they aren't really. About 2 cloves garlic minced. 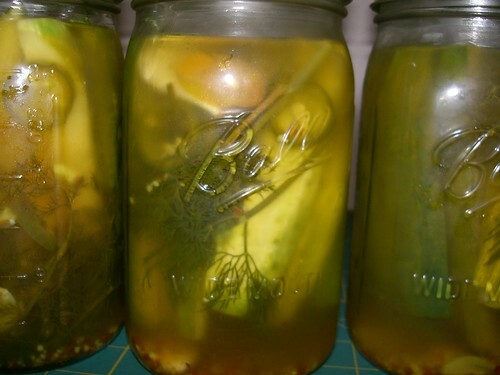 Take 5 clean quart size glass jars and fill with the cucumber spears, add the jalapenos and garlic (1 or 2 cloves depending on how big your clove of garlic is) evenly to each jar. Add one sprig of dill to each jar. Carefully pour the hot pickle mixture into each jar, making sure the cucumbers are covered. Put in the refrigerator and wait 7-10 days before eating. Can keep in refrigerator for 3 months. 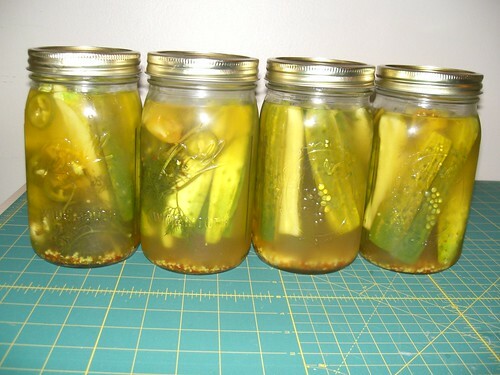 If you make some pickles, send me pics and let me know how they turned out! 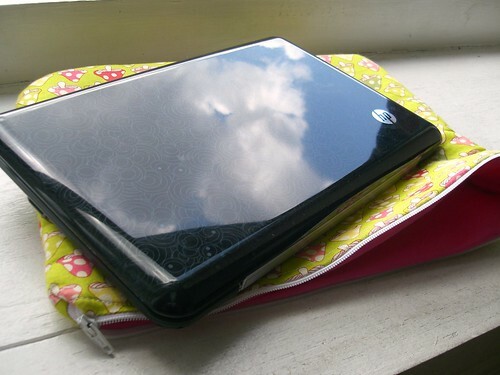 I got netbook for my birthday! Since it is so shiny and cute, I didn’t want it to get all scratched up or damaged when I was carrying it around. So I decided to make a padded sleeve for it for protection. 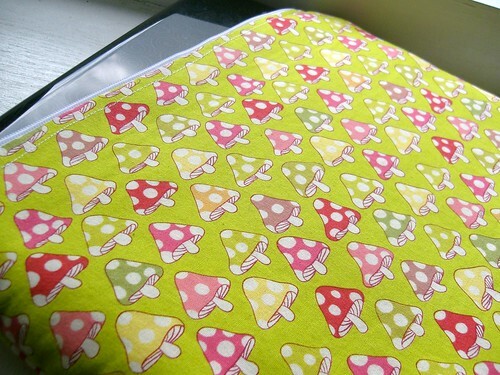 I used this super cute mushroom fabric called Tillbrook Toadstool in lime green and just a bright pink solid for the inside lining. In between the two, I used fusible fleece as the padding, and to give it some body to stiffen it up. I am mostly happy how it turned out, if I did it again for this netbook, I would make it about an inch shorter in height, just for a closer fit. Width wise it is perfect. I also would have boxed the corners to give it a little depth. 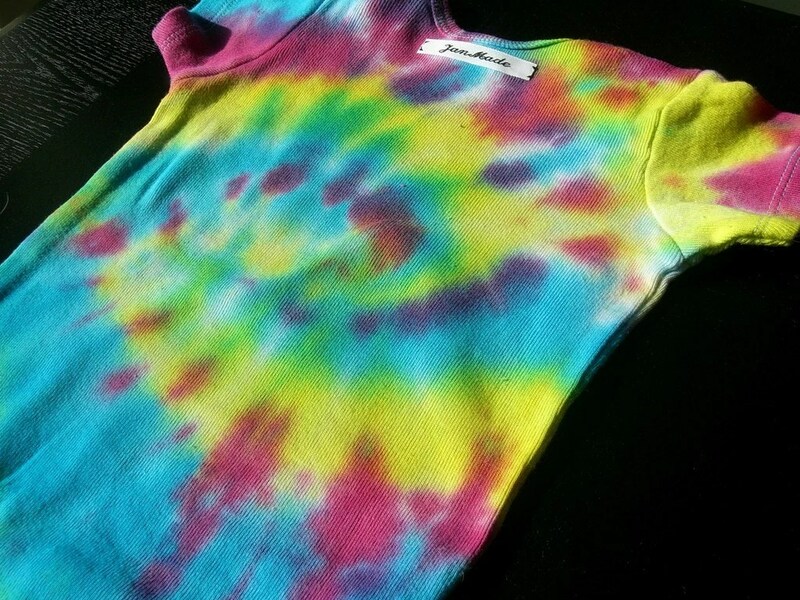 Overall, this was a pretty simple project. I am thinking of offering these in my etsy shop as custom orders, that way I can make them to fit the customer’s specific laptop dimensions. I feel like this is a useful thing that people would also like to have fit their personality with the fabric choices. My etsy shop hasn’t sold anything in a while, I’m hoping this would help boost my sales.